This may need a new blog post, but I’ll put the details here. If I could use one word to describe the quality it would be: Poor. The quality sucked and overall I was just not happy. The highlights were blown out losing subtle details. I use the same computer and have no issues at other printers. They put a thin wooden backing on the canvas making it hard and ugly. Why not a nice black paper backing? The canvas itself is not stretched on the frame improperly. I used a sharpie to clean it. The ink flecks when you lightly scrape it on something. On one in which I ordered a dust cover, it was a 1/8″ thick particle board backing nailed to the frame. It was the wrong size as it was 1/4″ wider than the print. I expected the nice thick black paper but instead received this hideous looking brown particle board piece of crap. But the old saying goes: You get what you pay for. And I paid little so I got little quality. I showed this image to a customer and immediately the screamed “I WANT A BIG PRINT!” So I had a 24×36 made. The print quality was mediocre and the details of the clouds were lost. 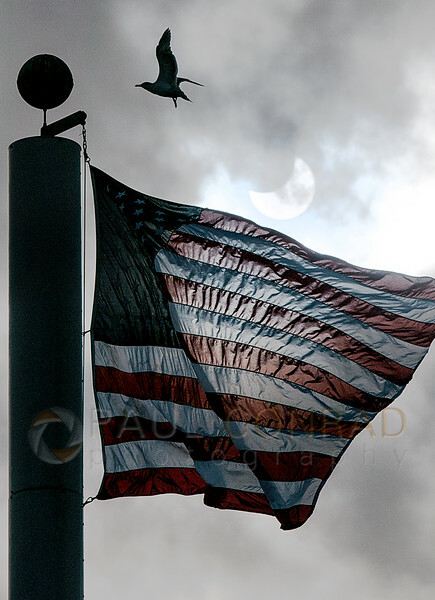 © Paul Conrad/Paul Conrad Photography – A seagull lands on the flag pole at the intersection of Northwest and Birchwood Avenues in Bellingham, Wash., during the partial solar eclipse on Thursday afternoon Oct. 10, 2014. ORIGINAL POST: A few weeks ago a gentleman from Canvas Champ printing company contacted me to see if I wanted a free canvas print. Jainam asked if I wanted to critique the company’s quality and if so, I’d get a free 16×20 inch canvas print. Hell, why not I thought. A free canvas print and in exchange for a critique of the workmanship. I love stuff like this. Earlier, I had the same thing happen but with a Think Tank City Walker 20 camera bag. Beautiful bag. Love it and still use it to this day. You can read more here: Not Just for City Slickers: the Think Tank City Walker 20 Shoulder Bag. 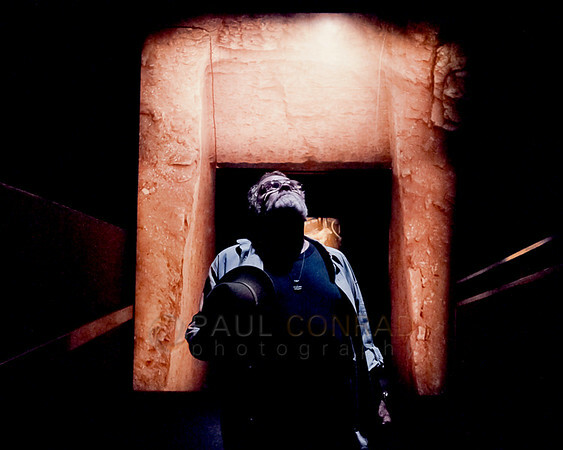 © Paul Conrad/Paul Conrad Photography – Dad at the King Tut exhibit at the Pacific Science Center in Seattle, Wash. So I sent them a file of my father-in-law Todd I shot while we were at the King Tut Exhibit at the Pacific Science Center in Seattle, Wash. My wife Heidi says it’s her favorite photo of him and since he died in December, we wanted something nice. How serendipitous since we were wanting to make a large print for our wall. I emailed the image to Canvas Champ and within 3 days received an email stating my print was on its way with expected delivery in 7 days. And it was coming from India. Pretty impressive. 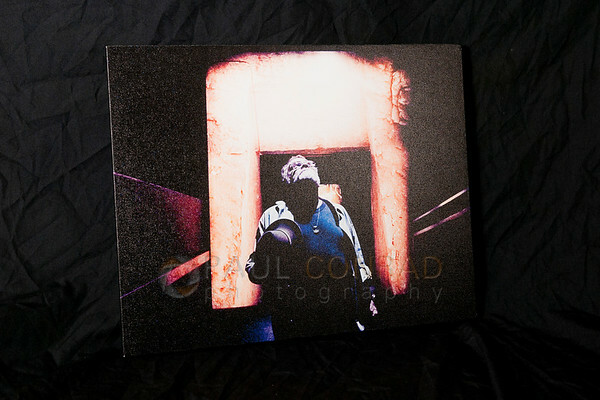 © Paul Conrad/Paul Conrad Photography – “Dad at King Tut” printed by Canvas Champ. The highlights are blown out a little leaving a white splotch above him. Upon arrival, I inspected the packaging for signs of damage. None. Happy with that, I opened it. It was packaged pretty well. Good, clean packaging. When I finally unwrapped the print, I was at first amazed by the construction. Strong, sturdy, and it had a foam insert to help strengthen the print and frame. The canvas is wrapped tight around the birch wood frame, the corner folds were tight, and the quality is superb. 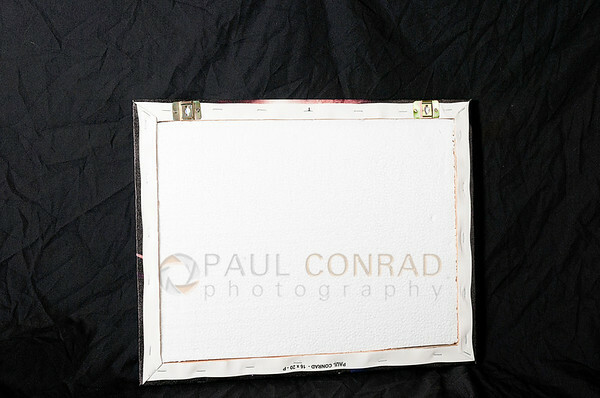 © Paul Conrad – The foam backing on the print made by Canvas Champ, and showing the construction of the framing. The foam acts to stiffen the entire print. At first, the image looked pretty good. However, I think the highlights were a little blown out. This could be the difference in monitors, mismatched color profiles, or an uncalibrated prints. As CC said to me they calibrate the printers daily, it leaves too reasons why: my profile didn’t translate to what they use or the printers don’t bring the image up and do some rudimentary toning. The blacks and midtones are wonderful. Deep rich blacks with great contrast and color in the midtones. The image quality overall is acceptable. Some of the things I noticed how you needed to hang the picture. It has two hangers that don’t allow you any error when mounting it on the wall. If you’re off a tad, you have to pull on of the nails or hooks out and redo it. A pain if you ask me. Not everyone has a laser level to make sure a level mount. You need to have room for error. There needs to be a better way to mount it. Perhaps a sawtooth hanger such as what Bay Photo or White House Custom Colour provide for their canvas prints. Another is that the back is open which exposes the foam and a lack of felt tabs. Canvas prints I had made at either Bay and WHCC have a black lining covering the back. A combination of that plus the foam insert would be great. It was also missing felt tabs which keep it from scratching the wall if the artwork is moved. 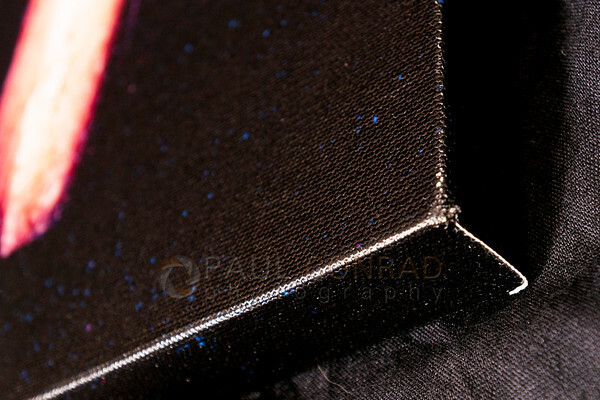 © Paul Conrad – Close up of my Canvas Champ print showing the exposed canvas edge. and somewhat sloppy technique. One of the things that I find slightly annoying is how the corners are folded. The edge of the canvas shows and is white against the black printing. This is alleviated by simply using a different folding technique. I could easily do it with a sharpie, but if I’m going to spend money on a print, I’d like to be able to hang it without filling in exposed white canvas with a sharpie. Canvas Champ says they use archival inks on giclée Epson printers. In an email about ink types and whether they tone the images to match the profile of the printers, they only said they calibrate the printers daily. I know through personal experience both Bay Photo and WHCC convert the embedded color profile and then tone, if needed, to match the output of the printer to make sure the best quality print. 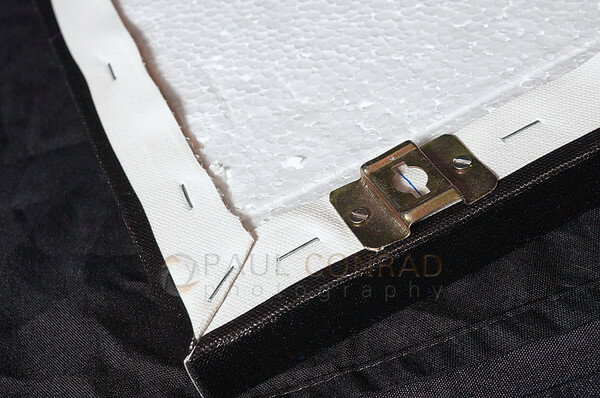 © Paul Conrad – The back of the Canvas Champ print showing the exposed foam insert, staples, and mounting hardware. The frame is constructed out of birch wood which uses stainless steel nails in the frame construction and stainless steel staples to mount the canvas to the frame. The styrofoam insert is glued to the back of the canvas and the frame to add overall strength. CC does have a cost edge over Bay and WHCC. Their lower price makes getting some of my landscape images printed even more enticing. 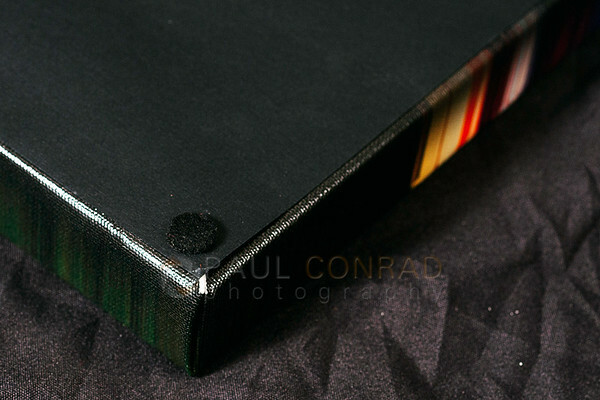 © Paul Conrad – The back of a Bay Photo canvas prints showing the tight corners, black cover, and felt tabs. Notice on the back of the Bay Photo Lab print how nice it looks compared to the Canvas Champ. If CC were to implement this backing in addition to the foam insert, they will have one great product. On a scale of 1 to 10, I’d give this particular print a 8. Mainly it loses points on the exposed corner, exposed backing, and difficult mounts. Overall I believe this to be a fairly decent product. In fact, Canvas Champ has an “99 year guarantee on all products , so at any time you feel the canvas is sagging , you can just return it for a new canvas with same image . No questions asked.” as said to me in an email. But, to better judge their quality, I’m going to buy a few more canvas prints using a different name. You can’t really judge by one photo, especially one that is given to you for a product review. – Bad corners due to poor construction technique. – Exposed foam back and staples (cover it with a black backing to clean it up). More of trim issue, but still needed. – No felt tabs to prevent scratching your wall. Yes, you can buy these at a hardware store, but it should be covered in the manufacturing. – The blown out highlights. Color correct before printing. – Mounting option as shipped. Using a wire or the sawtooth hangers would work best as opposed the current option. Also according the email, they print 20,000 sq. ft. of photos per day. That’s an astonishing 18,702 11x14s!!! That’s a lot! For a better understanding of their product, visit their site at Canvas Champ Printing. Well, glad to hear. How is the quality of construction and image quality. Cheap is one thing, but quality is another. I recently received a canvas print from Canvas Champ. I have received many canvas prints in the past from other vendors such as CGpro prints and Canvas on Demand and have been happy every time. I decided to try Canvas Champ because they had a discount. I was first wondering about why a US company was printing in India since I was concerned about the quality. The print had a quick turnaround and shipping did not take very long. The colors on the canvas were good. The print did come with some large spots were the ink did not get on the canvas in the sky which was very evident. Also the black sides did not really line up with the edges. The final straw was putting the canvas in the box and removing it once scraped off some of the image area along the entire top edge of the panoramic and this was with the box open along one edge. Canvas Champ obviously does not have any quality control or they would not of sent the image with such large spots (not on the image). As far as quality, the ink should not just fall off putting in the box one and taking it off. I do not recommend this company at all and I think they should let people know were the print is being printing. Thank you Bob for commenting. Sorry that you had problems. Did you get it fixed by them? If you did, was it better? How fast did they respond? Did you have to send the other back? I’d like to know. I had a canvas print made by Bay Photo and it had errors. There was a vertical blue line about 1/3rd from the left side. When I called them to let them know. They fixed it and sent a new one. And yes, they should let their customers know where it is being printed. As for the answer of why the print in India: super cheap labor. It’s cheaper to print it there then send via UPS or FedEx to the US, than have a facility in the US. Again, thank you for commenting on and visiting my blog. Nice work. I was doing an image search for canvas quality. Based on what I’ve found, Canvas Champ prints their logo on the rear. I can’t say I’m a fan of that. However, I’ve noticed that the back of your canvas doesn’t have “Canvas Champ” printed on it. Is this something you requested? Or did C.C. just recently start doing this? Thank you for commenting. I do not know about the logo. I don’t know if it’s a recent thing. A logo on the back of their work is no different than logos on cars, camera gear, or other products buy. At least it’s not on the front. Now that I would be against. the print quality was terrible I then had an argument by e-mail informing them their ”metal prints” are NOT true metal prints. Thank you. The issue of them changing construction methods was confusing for me. I can get a better quality canvas print made at Costco. And it’ll be printed well. Thank you Stuart. If they just kept focus on the printing quality, I’d be fine. But they change construction on how they build the frames. Costco, believe it or not, makes wonderful canvas prints and they are just as cheap. I had a print made for a friend when I shot her wedding and it was fabulous. Good quality, good print, good canvas. Thanks again for commenting. Sign up for email alerts when I post more blog entries. positive way can take us a long way. your preference, there are various types of hanging options which you can avail from our website. colours in the photo appearing on your screen would exactly reflect on your canvas print too! Thank you, but it was that fact I used the same image to have printed at the same size and getting two different quality canvas prints. I was shocked at how bad the bad the second was built. It was overtly heavy, and that backing was just unnecessary. Quality control of the finished product seemed to be lacking. I would like to continue trying your product, but if it’s any indication of the last one, I’ll take my business elsewhere. Pablo , We’d love to send you another print . We can on request manufacture the print without the backing board too. Although we recommend it for a tight stretched look we understand that you might have different choices. Please let me know if we can send another print and have an updated on your views about our product. Who would I send the image to and how much would this be? I do not like the backing you use to “stretch” the canvas. You should be able to stretch the canvas around the stringers with out that hideous back. Other places such as Bay Photo or White House Custom Color do it. Just sent you an email. You can send in the files to us at jainam.shah@canvaschamp.com. Hi Paul! Thank you for for your review of Canvas Champ. But, I have to wonder if you & I are dealing with the same company? I placed two orders Nov 24th, 2017. As of today, I only received one of my orders. Both canvases were only 11×14. I have called repeatedly the only phone number listed anywhere. I’ve emailed & messaged them multiple times. I have yet to receive a call back or anything. Their customer service is atrocious. The one canvas I did get today is horrible. Like you said the Hi lites are way blown out. I would never give it as a gift. I wish there is a phone number that I can call to complain etc. I will never use the company again. Thank you for the comment. So sorry to hear about all the troubles you are having. Yes. The very same company. I’ve had photogs Seattle area complain of the quality. Not good. I steer people away. They are very inconsistent with quality. The number they have listed is 800-993-0992. I called and it went through. Maybe try again? Hope you get this all worked our.